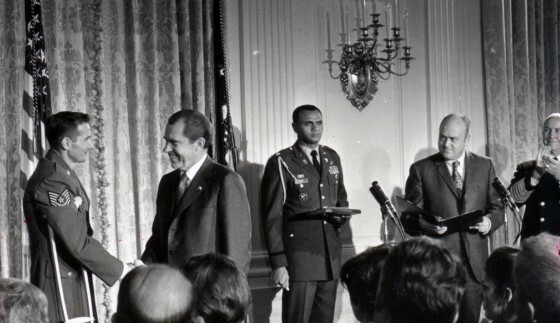 President Nixon presents medals to members of a search and rescue mission to Son Tay, Vietnam, on November 25, 1970. …first, in reaching a settlement of the war that an integral part of any settlement that is agreed to must be a settlement that is satisfactory on the prisoner issue and, second, clearly apart from reaching an overall settlement of the war, that this Government will do everything that it can to separate the prisoner issue from others and have it handled as it should be, as a separate issue on a humane basis. From then on, policy makers regarded retrieval of the prisoners of war with equal importance as a Vietnam peace settlement. Shortly after President Nixon’s statement, the Department of Defense, with the strong endorsement of Secretary of Defense Melvin Laird, published a comprehensive review of the country’s prisoner of war situation–a review that analyzed current policy, future policy options, conclusions and provided recommendations. Attaching diplomatic leverage to the release of U.S. prisoners of war with the North Vietnamese proved difficult, if not impossible. Progress in the peace talks evaded the U.S. at all turns; convincing the North Vietnamese to release prisoners of war was no less of an uphill battle. Coupled with growing pressure and urgency at home to do something to help the suffering POWs, the administration had to turn to alternatives. In August of 1970, Secretary Laird authorized the formation and training of a task force assigned the duty of rescuing POWs. The operation, dubbed Ivory Coast, enlisted an expert combat cadre of 56 Army Special Forces soldiers, 92 airmen, and 28 aircraft with the mission to extract the prisoners of war thought to be located at Son Tay, North Vietnam. On the night of the raid, the task force failed to locate the American POWs, but suffered no casualties while inflicting heavy casualties on North Vietnamese guards. The operation was a major tactical success, albeit a loss for the intelligence community, which had failed to locate the new whereabouts of the POWs. What these men have done is a message, a message to the prisoners of war still in North Vietnam, to their wives and their loved ones, some of whom are here, that the prisoners of war have not been forgotten and that we will continue to do everything we can at the diplomatic table and in other ways to attempt to bring them back home.